Huge Experience, Professional Staff, and a Strategic Approach to Each Case. Serving Clients Since 2009 with an Emphasis on Family Based Immigration. Looking for a Fiancée Visa Attorney in New York? When you need a professional fiancée visa attorney, be sure to have an experienced lawyer and law office on your side. 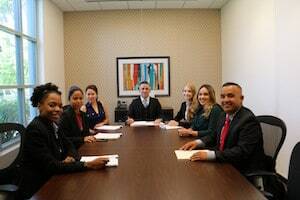 We at the Law Offices of Deron Smallcomb can provide legal guidance and counsel to clients in New York, allowing you to pursue your desired goals in fiancée visa cases. Fiancée Visas can be granted when you meet all of the qualifications and file the paperwork correctly. You can trust our team of professionals to work diligently towards your fiancée visa in New York. We provide you with a professional fiancée visa attorney to look after your paperwork and ensure your fiancée visa documents are accurately filed from Brooklyn to USCIS. For people throughout New York, working with an experienced fiancée visa lawyer can make all the difference in their future. At the Law Offices of Deron Smallcomb,we provide both aid and guidance to anyone near New York in filing the fiancée visa petition. The Law Offices of Deron Smallcomb team of fiancée visa professionals knows you will have questions. Whether its about how to make sure your fiancée visa application is processed in a expedicious manner, or about the content of your fiancé visa petition, our New York office can help. It is important to understand that changes in federal laws regarding fiancée visas can and do occur. If the rules change, trust us the Law Offices of Deron Smallcomb to understand the changes. We encourage you to contact us for a fiancée visa case evaluation, so you can find out what our legal team can do for your situation. Whether it is complex or straightforward we can help. My asylum case worried me very much. After speaking with Mr. Smallcomb, I was much surer that everything would be done ok. He and his staff helped me to file and get my work card. I was lucky to have their help and the price was lower than most lawyers. Adam S.
Very Professional, very thorough and simplified the process so you know what to expect and what is required. Very satisfied with the Law Office of Deron Smallcomb, Thank you. Robert S.
These folks were a critical part of my k1 visa preparation and subsequent parts of the process to eventual citizenship. Additionally, they helped with my stepson green card process. I will definitely use their services as my stepson heads for citizenship. Very professional, extremely competent! Kevin F.